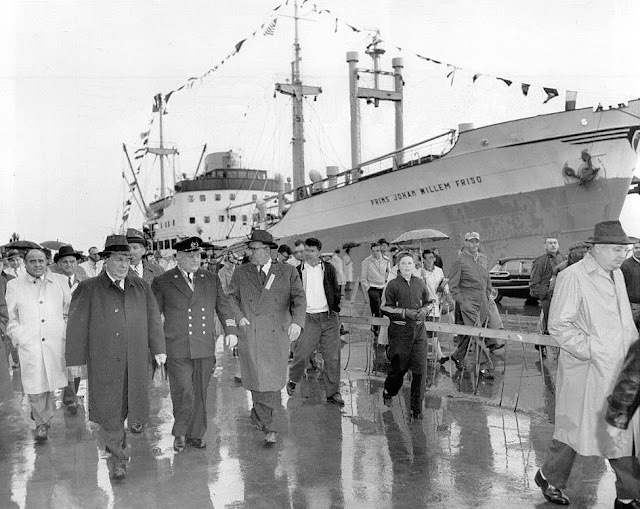 April 30, 1959 – At 10:30 a.m. the Dutch freighter Prins Johan Willem Friso, slides into a berth at Navy Pier and becomes the first ship to travel through the new St. Lawrence Seaway to Chicago. Forty American Indians ride a tugboat out to the ship and accompany it back to the dock where Mayor Richard J. Daley and the Fifth Army band greet the ship and its captain, Sander Klein. From the dock the mayor escorts Klein to Michigan and Ohio Streets where a parade kicks off, heading down Michigan to the Blackstone Hotel for a reception at which the captain is made an honorary citizen of Chicago. A small amount of the ship’s cargo is offloaded from at the pier, but the bulk of the freight will be taken off in Calumet Harbor where the ship will receive a cargo of industrial and agricultural products bound for European ports. April 30, 1903 -- A new tactic is used in an effort to appropriate land in Grant Park and use it for the construction of public buildings. The Illinois House of Representatives votes on a Senate bill to provide a site for the privately-funded Crerar Library, a legacy of Chicago businessman John Chippewa Crerar who left $2.6 million as an endowment for a free public library. The bill will empower park commissioners to authorize the construction of a free public library building on a site of their choosing, provided district tax payers approve the plan in a municipal election. 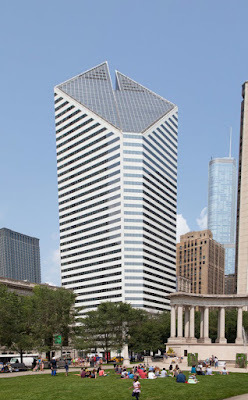 The Chicago Daily Tribune editorializes, "There is land east of Michigan avenue where a site is available on which the trustees of the Crerar library will erect a handsome building if given an opportunity to do so. The land cannot be put to a better use. The house should give them an opportunity by concurring in the senate bill it is to vote on today." Although the legislation passed, the referendum never made it to the voters. The battle over the library, led by merchant A. Montgomery Ward for much of the rest of the decade, continued all the way to May of 1912 when the library trustees admitted defeat and announced their intention to purchase the land at Randolph and Michigan for the building. 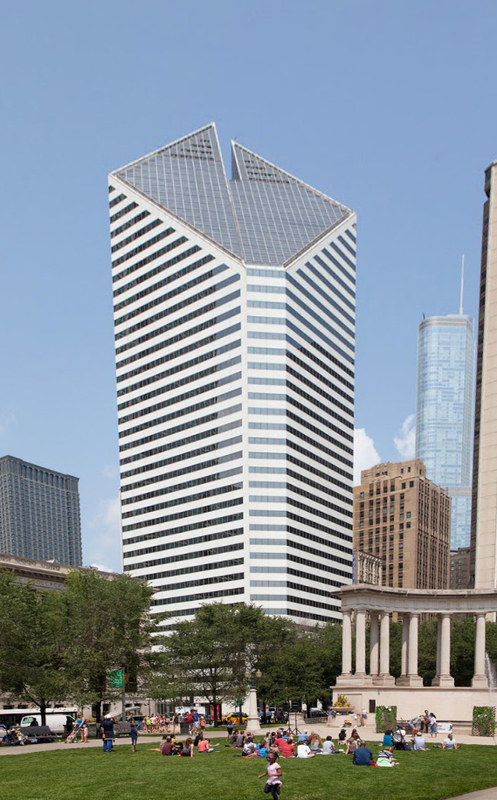 That building, designed by Holabird & Roche was delayed by the outbreak of World War I and finally finished in 1919. By the 1950's the building could no longer support all of the library's holdings, and the institution affiliated itself first with the Illinois Institute of Technology and then with the University of Chicago, where the current library, designed by Stubbins Associates, was completed in 1984. 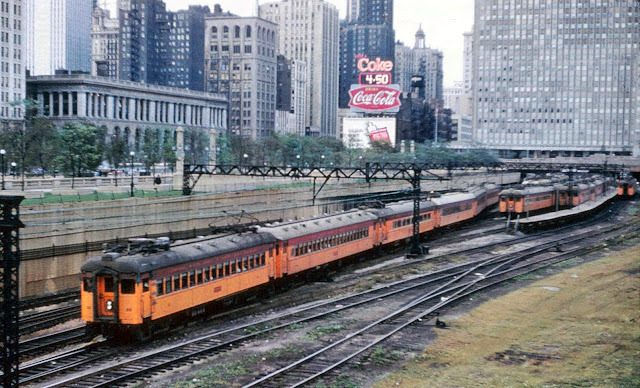 The late 1950's photo above shows the 1919 library across Randolph Street from what is now the Chicago Cultural Center and across Michigan Avenue from the Coca Cola sign. 150 North Michigan Avenue occupies this location today. That is the A. Epstein & Son's design with the diamond top, pictured below.